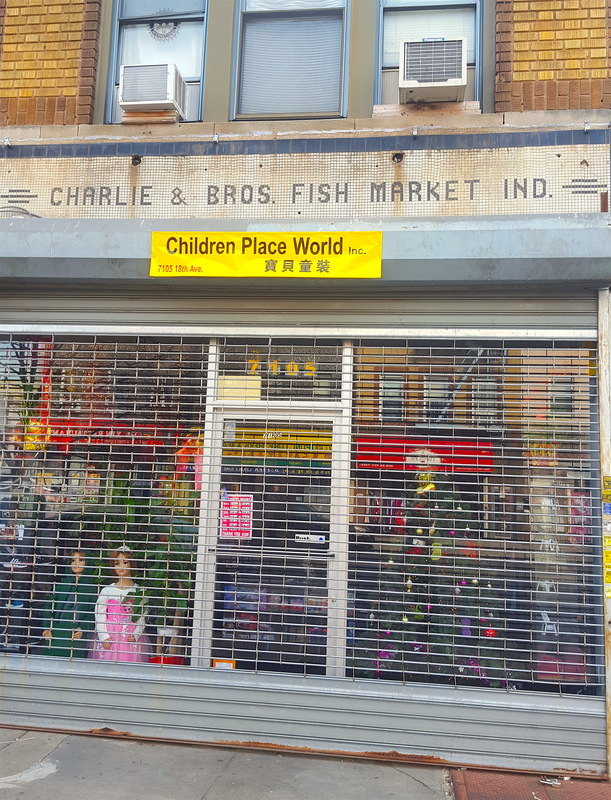 Dark and grimy Midtown blocks are loaded with hidden treasures. 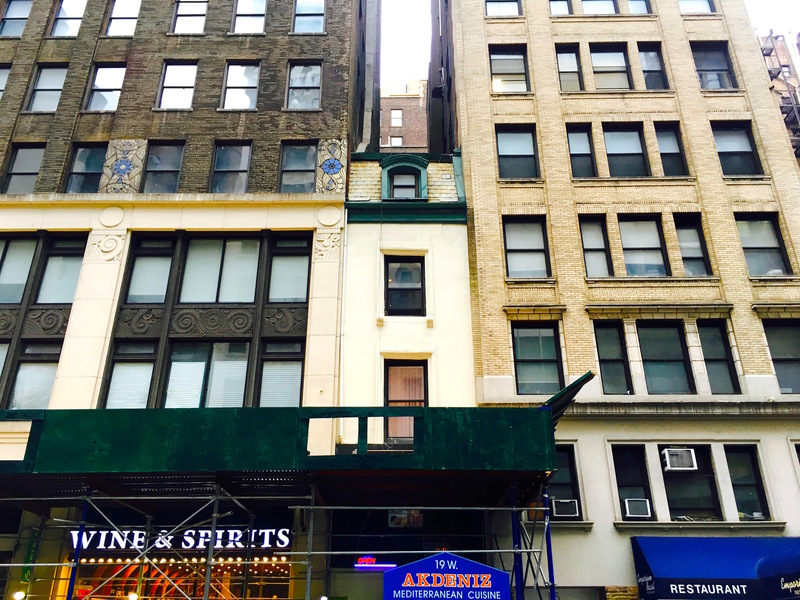 Take this slender walkup at 19 West 46th Street, for example. 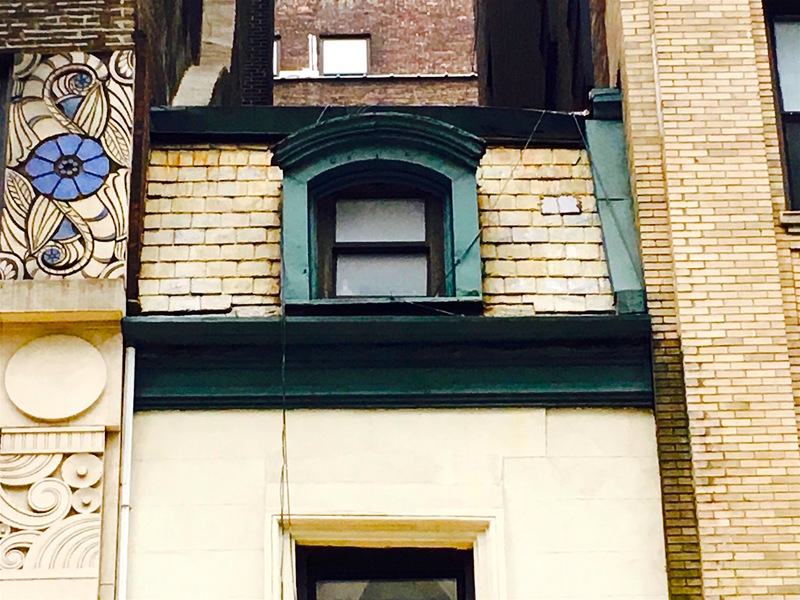 It dates back to 1865, when West 46th Street between Fifth and Sixth Avenues was a quaint residential block close to the Croton Reservoir rather than a corridor of small businesses in the shadow of Rockefeller Center and Grand Central Terminal. I didn’t measure the building, but I wish I had. Number 19 is so skinny, there’s only room for one window per floor, not including the ground-floor restaurant space. Diminishing it even further are the two loft buildings (one with gorgeous Art Deco designs) that sit just in front of it. These two relative newcomers to the block crowd out their skinny neighbor, so it gets even less light and love from passersby. And that slate mansard roof! It’s hard not to romanticize this 19th century holdout, even though it isn’t in the best shape. I can’t help but think of it as a testament to what a developer will build with a fraction of the size of a regular building lot, as well as how little space New Yorkers need. And of course, it’s proof that some of the most interesting buildings in the city are on the streets where you least expect them. 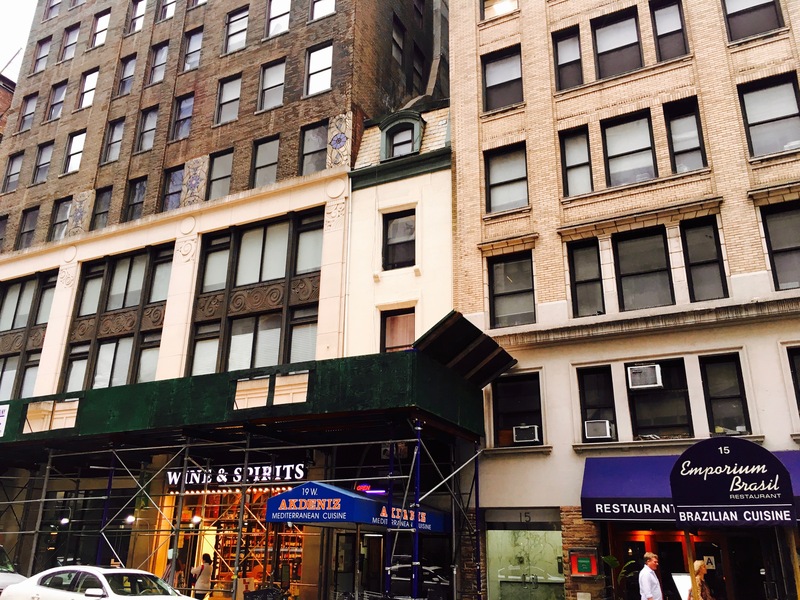 For more than a century, the two-story building at 527-531 West 36th Street held its own with its neighbors in this once-industrial part of Manhattan—away from more traditional retail stores and apartment buildings in the far west 30s. It’s an unusual survivor that looks a lot older than records reveal. Apparently constructed by 1910 (though one 1902 newspaper article said it was supposed to have five stories), the brick building has large arched windows and ornamental trim on the second floor. One of its earliest occupants was a fruit packing plant; another business was Rohe and Brothers, a wholesale beef and pork provisions company. 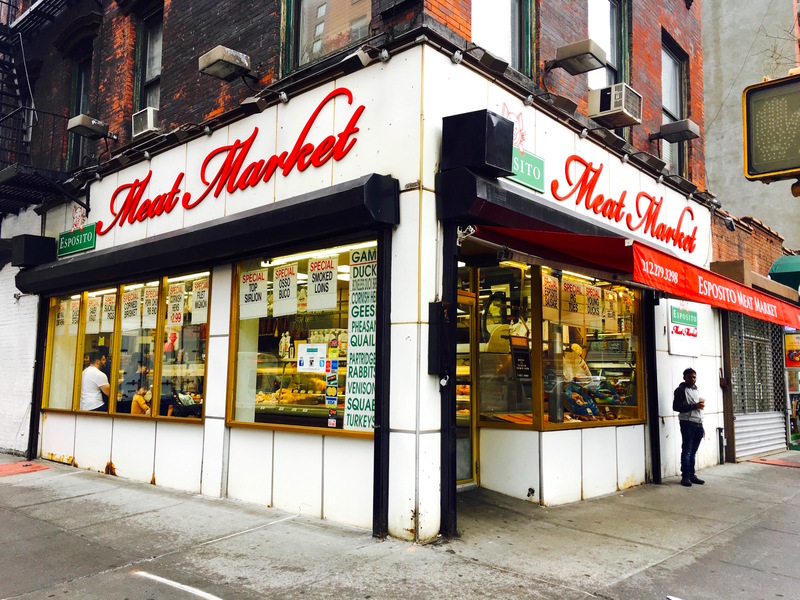 It makes sense that Rohe operated here; West 36th Street is three blocks from what used to be known as Abattoir Place because of all the slaughterhouses that turned cattle brought to the West Side via rail or ferry into beef. 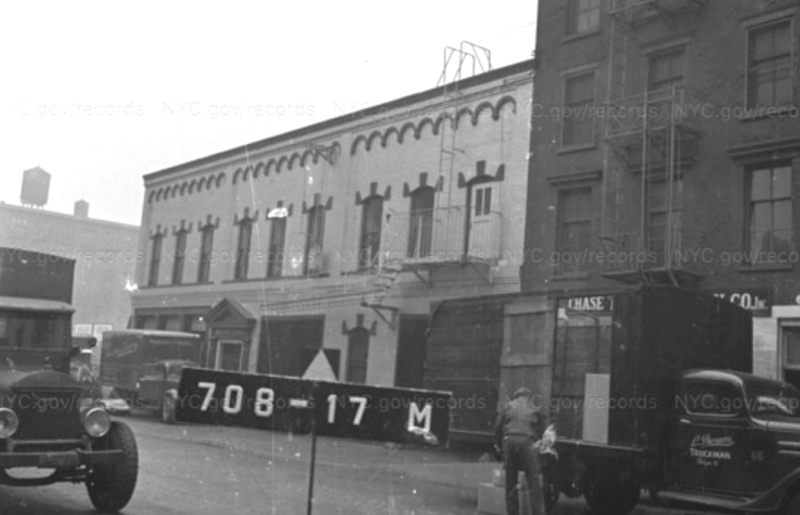 A milk distributor and pasteurization company operated here in the 1940s. 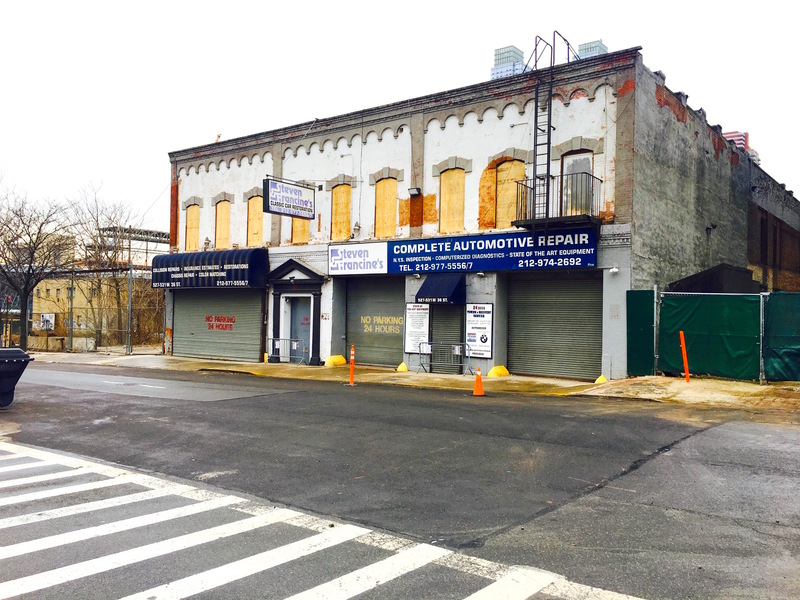 Soon the food packers and distributors were replaced by auto body businesses, like Steven and Francine’s, whose sign hangs on the building’s boarded-up second floor. 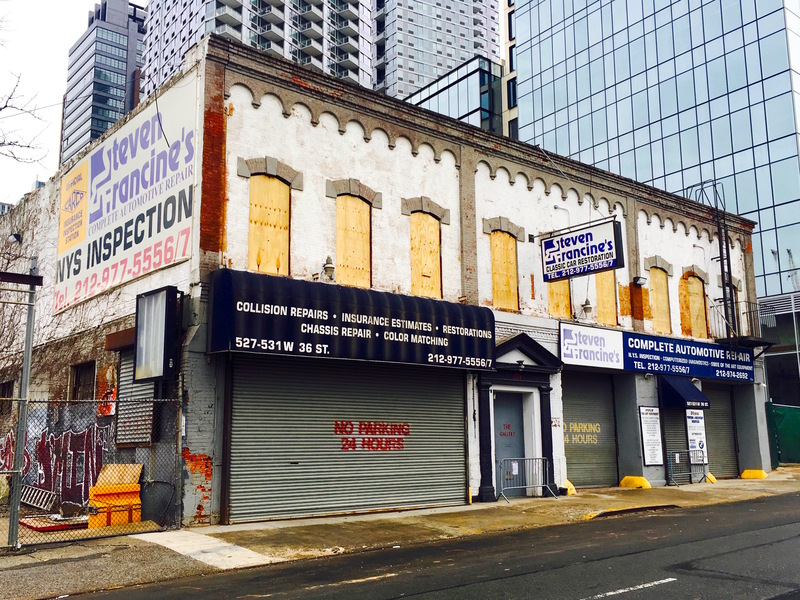 Recently, this humble holdout in the shadow of Hudson Yards’ steel and glass luxury towers was sold to Tishman Speyer for $20 million. 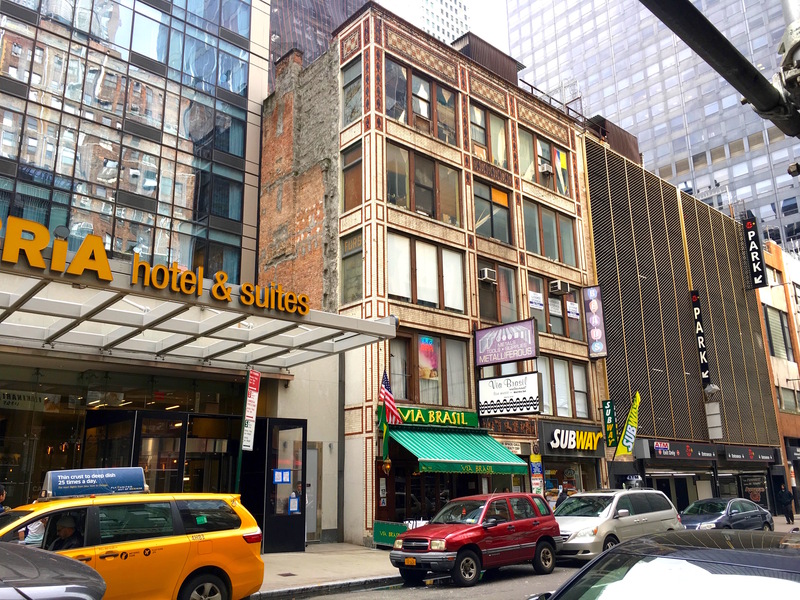 The real estate developer plans to turn the site into a park in exchange for air rights for another office tower going up next door. 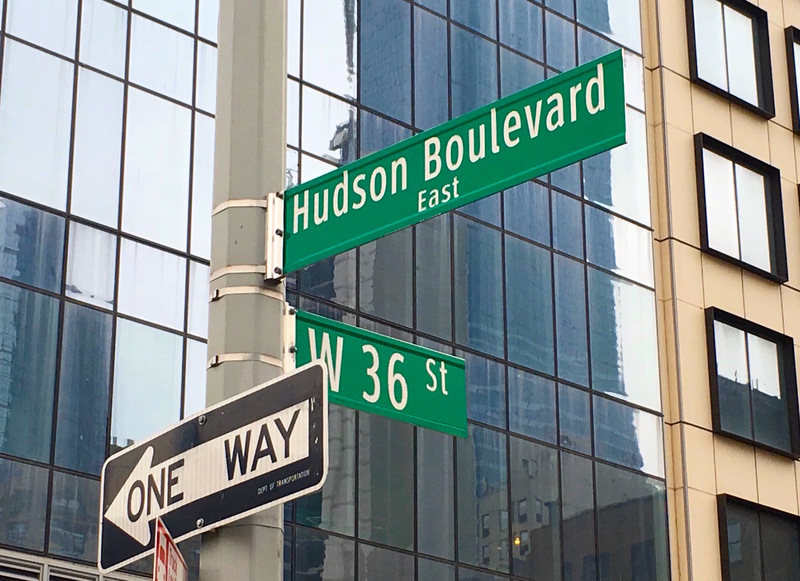 It’s one of the last remaining vestiges of the far west 30s (at the recently named “Hudson Boulevard”) on the fringes of Manhattan. But it won’t be here much longer. When Essex House opened on Central Park South in 1931, it was an instant hit with well-to-do, fashionable New Yorkers who didn’t let things like the Great Depression or Prohibition stop their partying. 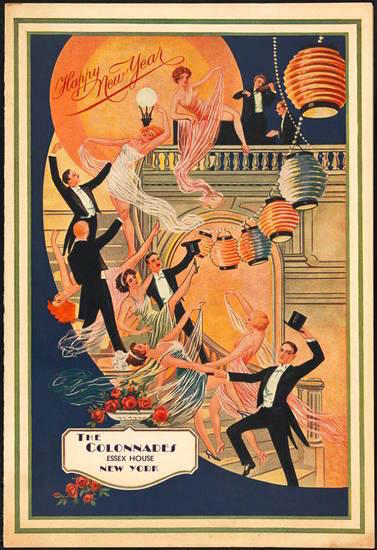 This menu card, from the Museum of the City of New York, is dated 1935; it shows New Year’s Eve revelers in the hotel’s Colonnades ballroom. On the back of the card are some of the food offerings for the night: Swedish relish, olives, and salted nuts as appetizers; mignon beef Bearnaise, braised celery au jus, and potatoes royale for the main course. Dessert: petits fours and glace vanilla nesselrode. 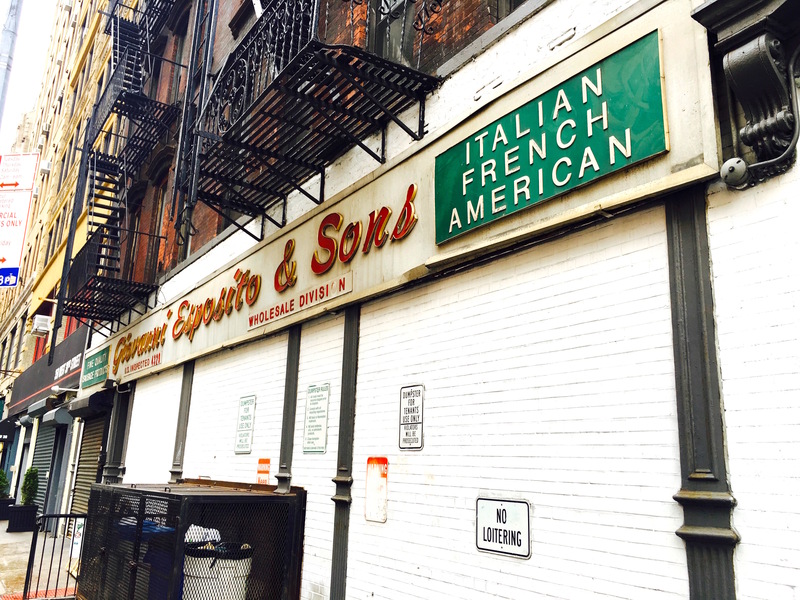 West 46th Street between Fifth and Sixth Avenues is shadowy and gritty; it’s a low-slung block of restaurants and small shops occupying converted brownstones and renovated office buildings. Because it’s one of those unusually frozen in time blocks, it’s a stretch with many mysteries. One I’ve always wondered about has to do with the box-like structure with big windows at number 34-36. Built in 1914 as a loft, the building’s entrance has what looks like a frieze with scenes of a charioteer and crowds of women and children, something right out of ancient Greece. It’s a strange and mysterious scene. 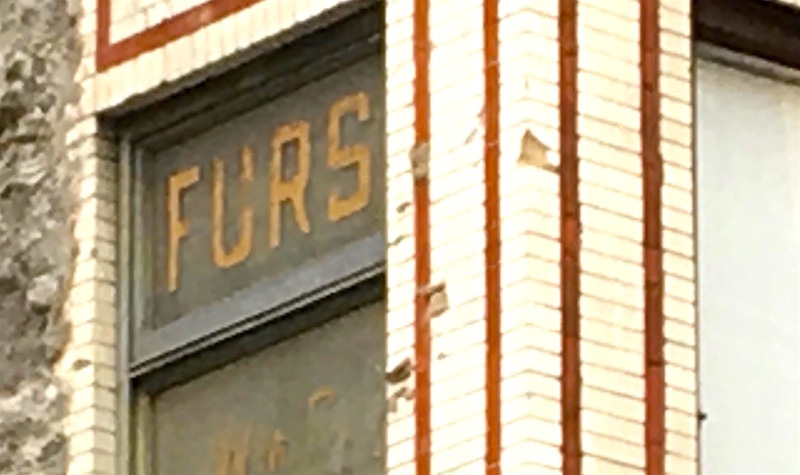 But even more mysterious to me is the sign in a small second floor window: furs. 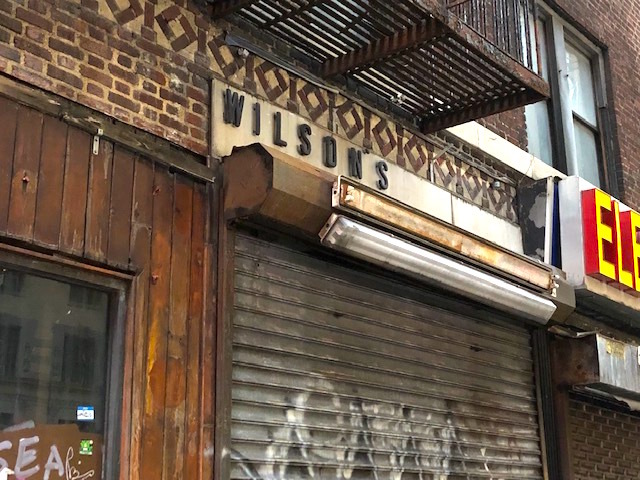 West 46th Street is a little north of the city’s former fur district, where furriers and fur manufacturers reigned through much of the 20th century. It didn’t take long to locate the furrier who occupied this storefront and find out that he worked here as far back as 1916. William C. Emerick advertised his “furs of the quality sort” in Harper’s Bazaar (above right) back then, 103 years ago. In 1920, he also appeared in a fur trade journal (above center). I don’t know when Emerick left the premises, but amazingly, his furs sign remains, slightly faded but perfectly legible. If you’re craving coffee in the contemporary city, you’ve got options: your local Starbucks, a mini-chain like Birch or Gregorys, even a corner no-frills bagel cart. 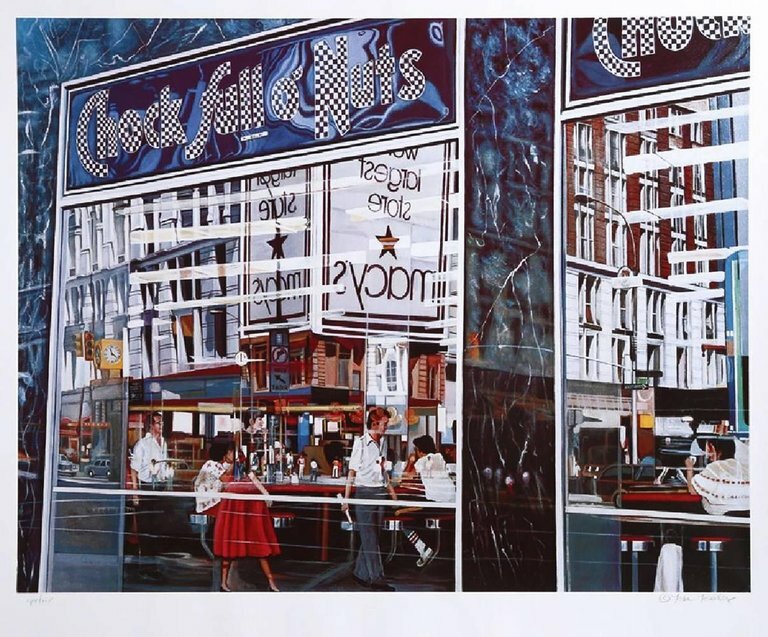 But in the 1950s, 1960s, and 1970s—before ordering coffee meant navigating a dizzying array of blends and milk options—New Yorkers sipped a simple cup of joe at one humble coffee house: Chock Full o’Nuts. 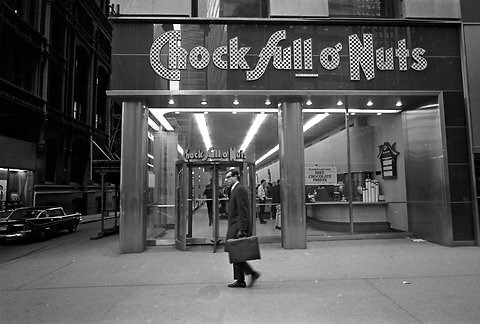 By the 1960s, about 30 Chock Full o’Nuts restaurants dotted the city. 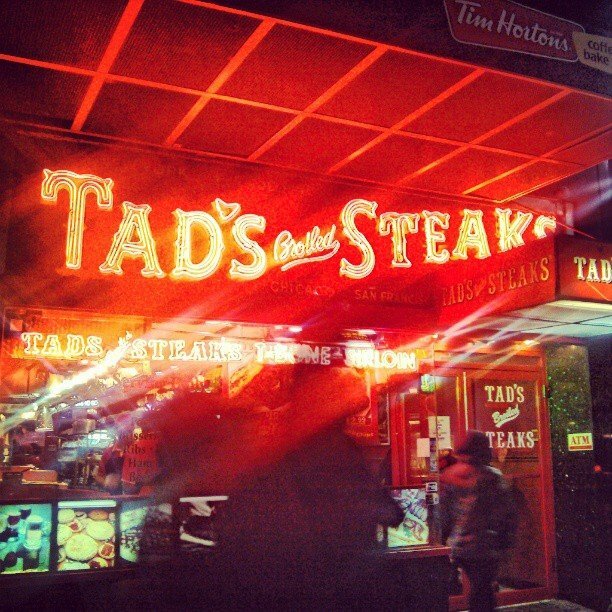 They were so ubiquitous, I wonder if any patrons questioned the name and what nuts had to do with it. 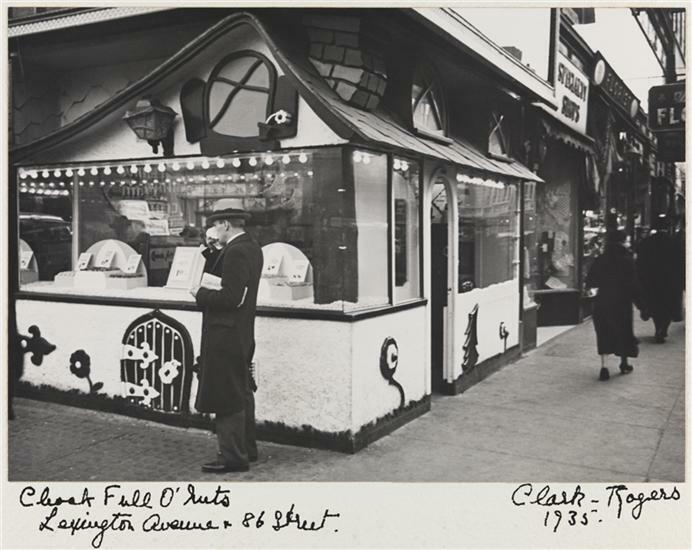 Turns out the chain actually began as a shelled nut shop in 1926. That’s when a Russian immigrant named William Black opened his first nut store in Times Square, according to Savoring Gotham: A Food Lover’s Companion to New York City. 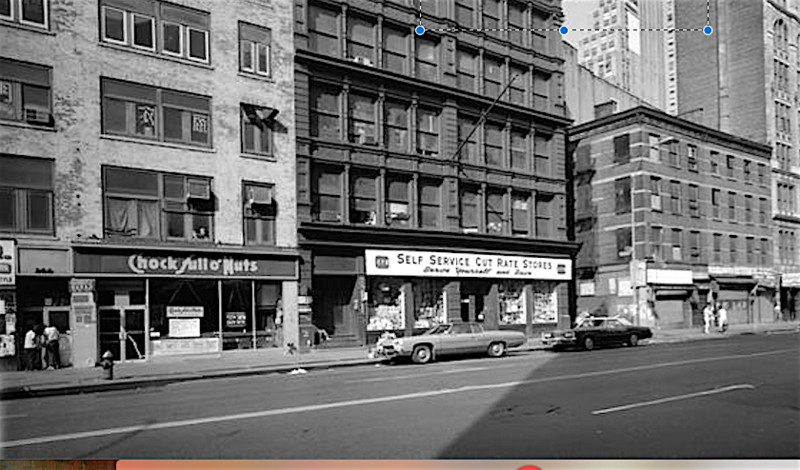 By 1932, Black’s original store under a staircase at Broadway and 43rd Street expanded, and he eventually owned 18 nut shops. 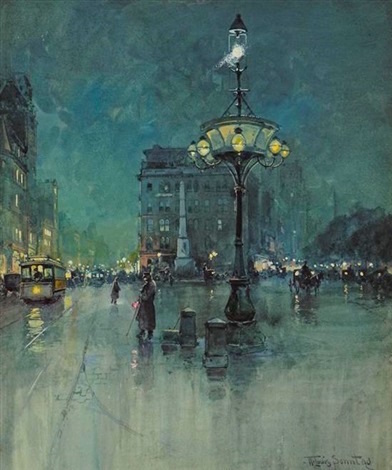 But with the Depression still raging, Black “converted his nut shops into inexpensive cafes where a nickel would buy a cup of quality coffee and a ‘nutted cheese’ sandwich—cream cheese with chopped walnuts on lightly toasted whole wheat raisin bread,” states Savoring Gotham. The famously delicious cream cheese sandwich would eventually be made with date bread, and the menu expanded to donuts, soup, and pie. When Chock Full o’Nuts reigned as the number one coffee shop in New York City in 1955, the price of a cup came in at just 15 cents. Customers appreciated the low price, no-tipping policy, and also the cleanliness. Employees prepared the food using tongs, not their hands. By then, the chain had introduced their own brand of coffee in supermarkets. The catchy TV jingle about the “heavenly coffee” is forever burned into the brains of every native New Yorker born before 1980. So what happened, and how did Chock Full o’Nuts fall? After Black died in 1983, the company didn’t adapt to changing consumer tastes, according to a 1990 Washington Post article. In 1988, the 18 remaining Chock Full o’Nuts restaurants were sold to the management chain Riese Brothers. 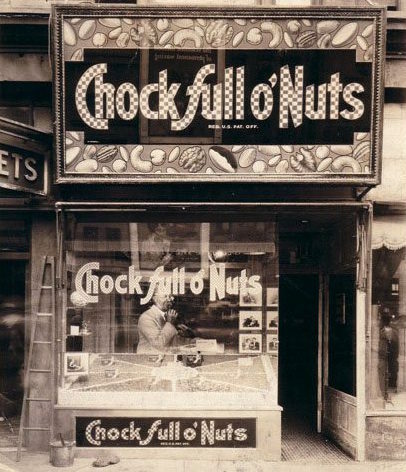 The last Chock Full o’Nuts hung on in the 1990s at Madison Avenue and 41st Street. 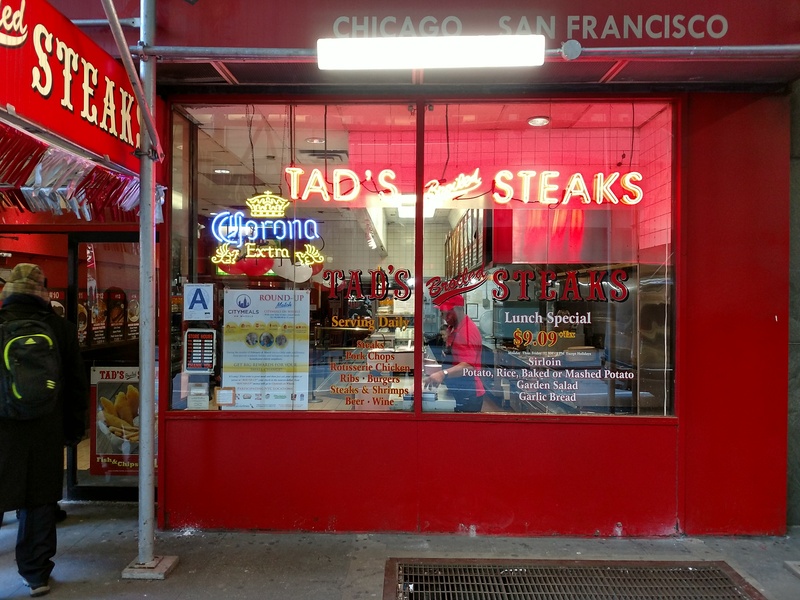 In 2010, the name was revived at a new coffee house on 23rd Street, but it closed two years later. Chock Full o’Nuts ground coffee can still be purchased in stores, its yellow, green, and black coffee can marked by an image of the New York skyline—a reminder of the restaurant’s place in Gotham’s culinary history.